With its extraordinary track record of screening hit movies and eventual award-winners on their way out of the gate, the Toronto International Film Festival kicks off for the 39th time. The 39th Toronto International Film Festival commences on Sept. 4 with a massive array of movies that UK distributors, exhibitors and home entertainment specialists say is one of the best. From the opening film – David Dobkin’s courtroom drama “The Judge” starring Robert Downey Jr., Robert Duvall and Vera Farmiga – to the closing gala – Alan Rickman’s period drama “A Little Chaos” starring Kate Winslet – on Sept. 14, TIFF will screen 285 feature films. Still, he agrees that he looks forward to “The Equalizer” with star Denzel Washington and director Antoine Fuqua (“Training Day”) back together. Other titles that caught Anderson’s eye in a quick scan of the TIFF announcements include “Foxcatcher” with Channing Tatum as Olympic wrestler Mark Shultz: “I’ve heard good things about this one”; “Pawn Sacrifice” with Tobey Maguire as US chess champion Bobby Fischer and Liev Schreiber as the Russian Boris Spassky: “Interesting; chess is a lot more exciting than people give it credit for”; and “The Riot Club” based on Laura Wade’s play about a posh students club at Oxford: “This seems to have been trailed for ages; good to see it finally hitting screens”. A David Cronenberg film is “really an event”, Wain says, and “Maps to the Stars”, a Hollywood tale starring Robert Pattinson, Julianne Moore, John Cusack and Mia Wasikowska, is a social satire that “should prove no exception”. He also mentions Sung Bo Shim’s “Sea Fog” (Haemoo), about smuggling illegal immigrants; Ramin Bahrani’s “99 Homes”, with Andrew Garfield as a desperate man whose family are evicted from their home; “Love & Mercy”, with Paul Dano and John Cusack as Beach Boy Brian Wilson young and old; Dan Gilroy’s “Nightcrawler”, a crime thriller with Jake Gyllenhaal; and “Before We Go”, a comedy drama directed by and starring Chris Evans. This story appeared in Cue Entertainment. 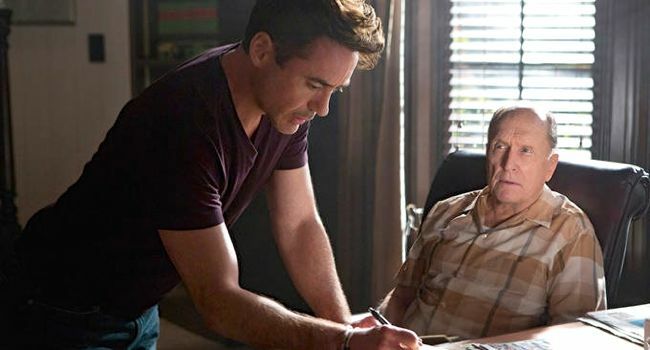 This entry was posted in Film, Previews, TIFF Toronto International Film Festival and tagged 'The Judge', Andy Anderson, Dave Wain, Mark Batey, Paul McGowan, Paul Traynor, Phil Clapp, Robert Downey Jr., TIFF, Toronto International Film Festival. Bookmark the permalink.